It is not government that will achieve Dr. King's ideals, but rather the people of this great country who will see to it that our Nation represents all that is good and true, and embodies unity, peace, and justice. We must actively aspire to secure the dream of living together as one people with a common purpose. President Abraham Lincoln sought to eradicate the senseless divisions of racial hierarchies when he issued the Emancipation Proclamation. Just over 100 years later, Dr. King continued this effort and called upon Americans to reject ugly impulses and prejudices, and to recognize the beauty and the humanity of all people, regardless of the color of their skin. Today, we remain steadfast in advancing their efforts, in hopes of hastening the day when all of God's children will join hands in freedom forever. NOW, THEREFORE, I, DONALD J. TRUMP, President of the United States of America, by virtue of the authority vested in me by the Constitution and the laws of the United States, do hereby proclaim April 4, 2018, to be a day to honor Dr. King's legacy. 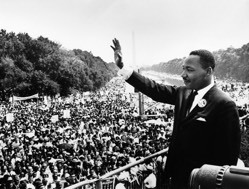 I urge all Americans to do their part to make Dr. King's dreams of peace, unity, and justice a reality.